Tonight, I experienced living proof that we should never too tightly rein in our idea of what's possible. Six months ago, back in the hot hazy days of August, while my daughters Lillie and Sophie and I were in Peru on a volunteer medical mission with Smile Network International, our beloved cat Theo decided to go on a walk ... and not come back. 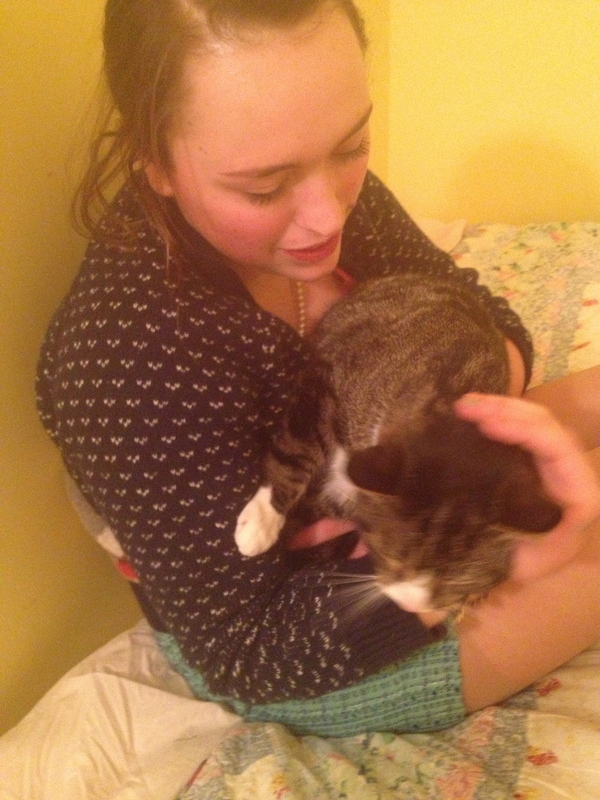 This was shocking and heartbreaking, because not only was Theo a birthday kitten for Lillie on her sweet thirteenth (she's seventeen now), but he was also the nicest, most affectionate, pleasantly lazy homebody of a cat you'd ever hope to meet. How could he just scoot out the front door and disappear without a trace? The girls and I got the dreaded email about Theo being missing from my husband Jon late one evening after a long day at the Cusco hospital. On the one hand he didn't want to tell us, but on the other hand he needed a picture of Theo and he knew I had many on my computer. I quickly searched my iPhoto for the best, clearest shots of Mr. Handsy-Pants, as I liked to call him, and emailed them to Jon, who made posters and plastered them all over our neighborhood. He trekked up and down our block and into the small patch of woods in our neighborhood park each morning, despite the fact that he works at Mayo Clinic--ninety miles from our home in Minneapolis--and must therefore leave home by 5:45 a.m. in order to catch his commuter bus. Still, Jon made these daily predawn rounds looking for Theo. But no dice. Weeks passed, and we got lots of calls and emails about various Theo lookalikes. None panned out to be our actual runaway. We checked shelters. We signed up for the neighborhood listserv (that we never knew existed until a concerned neighbor recommended it as a way to watch for Theo). We continued to walk the neighborhood. We put out bowls of delicious canned food. We turned up nothing but flies. More weeks passed, and the calls and emails about Theo stopped coming. We began to accept, in a surreal and painful kind of way, that we might not find our sweet cat. We talked about whether to have a "ceremony." Meanwhile, we sent Theo our wishes for a happy life wherever he was. We told ourselves that he'd found a nice new family, that he'd charmed his way into a comfy spot on somebody else's couch. We couldn't imagine any other possibility. Halloween came and went, then Thanksgiving. One chilly afternoon before Christmas, Lillie and I were in the kitchen making tea, and our conversation turned to Theo. "I just can't believe we'll never see him again or know where he is, or what happened," she said. Tears spilled down her cheeks and her breath caught in her chest until it became ragged sobs. I held her. There was nothing else I could do. Christmas came and went, then New Year's. Sophie moved to Florida, and Lillie's brother Max moved back home to stay for a few months before college classes resume next fall (he'd been serving a term in the Conservation Corps of Minnesota). Things changed. Things stayed the same. And then, this afternoon, buried in a flurry of work correspondence and business email, came a message from Jon. It stood out for its subject line: THEO?!!?!?. Jon had forwarded the latest digest from the neighborhood listserv, which featured a gigantic picture of our cat. Both of us knew instantly it was Theo, not an impostor. I compared the photo to several in my files, even though I didn't need to. It was definitely him. Someone had seen Theo several blocks from our house, and had been feeding him for a while before taking him inside last week. But this kindly neighbor was going out of town for the weekend, so asked his cousin to take the cat in, which the cousin did. The cousin, however, already had a cat. He didn't feel he could give Theo a permanent home. So he took him to the vet looking for a microchip (there was none). Then he took Theo to the feline shelter, but was turned away. It was full. So as a last ditch effort, the cousin of the good neighbor posted the pic of Theo and the message about him to our neighborhood listserv, along with the caveat that if he couldn't find Theo's owner before Monday, he'd be dropping him at the Humane Society. As you know, that didn't happen, because Jon and I picked Theo up and brought him home forthwith. We still can't believe it. Lillie is beside herself. We all are. And Theo is clearly very pleased to be home, despite being quarantined in Lillie's bedroom until his vet check (feline leukemia? parasites?) tomorrow morning. We hope he'll get a clean bill of health; he certainly looks plump, glossy, and happy. Which makes us think the story we told ourselves wasn't too far off, that most likely Theo has had a comfy couch to sleep on for most of his time away. Which begs the question of how or why he ended up outside again last week. Maybe, we think, he was trying one more time to find his way back home ... which miraculously, he did.